Realty Income added more new properties to its portfolio in 2016 than management had planned. Retail real estate investment trust Realty Income (NYSE:O) performed well in 2016, despite a big pullback in the sector caused by the prospect of rising interest rates. However, the company did an excellent job of capitalizing on the strong sector performance throughout much of 2016. Here's how Realty Income took advantage of its high stock price while it had the chance, and what to expect going forward. After an active year of acquisitions in 2015, during which Realty Income acquired $1.26 billion worth of properties, the company was expecting a relatively quiet 2016. Included in its original 2016 guidance was a projection calling for approximately $750 in acquisition volume for the full year -- rather low for the company, given its recent history. However, as the year went on, the company began to acquire properties at an increasingly aggressive pace. In fact, through the first three quarters of the year, Realty Income had already completed about $1.1 billion in acquisitions -- about 47% more than the company's original full-year goal. As you can see from the chart below, the company increased its acquisition guidance in all three 2016 quarterly reports that have been released thus far. Source: Realty Income quarterly press releases and supplementary data. The important story is why Realty Income chose to grow much more aggressively than it originally planned on. To understand why, consider the two main ways REITs can finance acquisitions -- by borrowing money or issuing new equity. And the environment was extremely favorable for both in 2016. On the borrowed money side of things, it's no secret that interest rates have been historically low for some time now. To cite one specific case, Realty Income issued $600 million in bonds in October 2016 with a low 3.00% interest rate. However, the real story is equity, which is Realty Income's preferred method of financing acquisitions. When a company's stock's price is high, it needs to issue less equity to fund a specific acquisition. As a basic example, let's say that Realty Income wants to acquire a property for $10 million. If its share price is $50, it needs to sell 200,000 shares of stock to raise the money. If the share price is at $70, it only needs to issue about 143,000 shares. In other words, it can buy the exact same property by giving up less equity. While this is a simplified example, it explains the flurry of 2016 acquisitions in a nutshell. When the original guidance was issued, shares were trading for just over $50. Over the next seven months or so, Realty Income's share price soared, peaking at $72.30 in early August. Even after the interest rate-driven pullback in the second half of the year, the stock remains about 12% higher than where it started 2016. As CEO John Case said in Realty Income's 2016 second-quarter earnings report, "... through the first half of the year we completed $663 million in acquisitions at record-high investment spreads relative to our weighted average cost of capital." While I wouldn't be surprised to learn that Realty Income slowed down on their acquisitions in the fourth quarter of 2016 after the share price pulled back, 2016's abundant opportunities for growth combined with management's willingness to aggressively jump on those opportunities could prove to be a big win for shareholders over the long run. 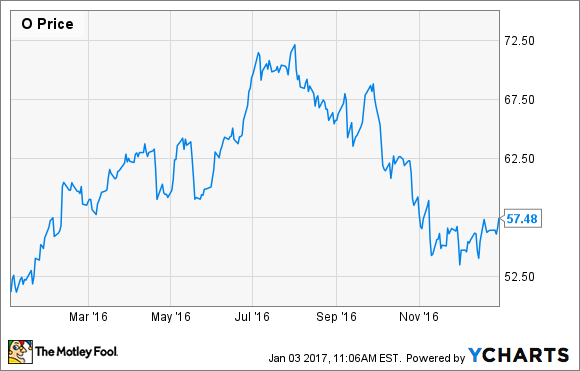 After a large volume of acquisitions in 2016, I expect Realty Income's growth to slow down considerably in 2017. It has already started to get more expensive to borrow money, and the Federal Reserve has projected three additional rate hikes during 2017. On the equity financing side, Realty Income's stock price isn't nearly as high as it was for much of 2016, so unless the company's share price spikes as it did during the first half of last year, Realty Income can't get quite as much value for newly issued shares. In a nutshell, Realty Income's cost of capital was a great opportunity in 2016, and the company did a great job of capitalizing on it while it had the chance. Shareholders should be pleased with management's actions as they recognized the great opportunity presented by the rally in the company's share price.